Summer is the time we get to break out of the confines of our homes and offices to soak up some sun and spend long afternoons with the family. When you’re camping, you may find that you’ve spent the entire day outdoors and your skin may not be used to so much exposure. You don’t have to be in the southern states to pay attention to the sun’s affect on your skin. 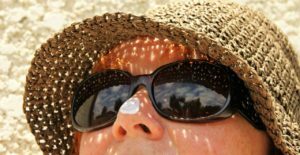 There are things you can do to reduce your risk of too much sun exposure. Take these precautions to keep from getting a sunburn and/or ruining your long awaited camping trip. This will not only keep you cooler but it will protect your head, face, and neck from getting sunburned. These three areas are the most exposed areas of our bodies and they really can take a beating on a sunny day. Make sure the brim of the hat covers you well and keep it on whenever you are outdoors. Your eyes can be damaged as much as your skin when the sun’s rays are at their peak. Wearing a pair of good quality sunglasses can reduce the sun’s damaging rays from harming your eyes and they can also protect the delicate skin around your eyes. You can deflect some of the sun’s rays by wearing light colored clothing. Make sure they are made of a fabric that is well weaved so the sun doesn’t easily penetrate to your skin. You’ve heard it before and it is true, you need to re-apply your sunscreen often, particularly if you’re out during the peak time of the day from about 11:00am to 3:00pm. Add more after you’ve been swimming or if you’ve been running and sweating a lot. Just keep on slathering that protection on your skin and it will go a long way in protecting you from a burn. Summer is an amazing time for getting outside and enjoying life. Just be sure to take care of your skin and you won’t be sorry.